Today Ubisoft announced that it is continuing its partnership with Gold’s Gym, the world’s leading authority on health and fitness, to publish a new game Gold’s Gym Dance Workout in the United States and Canada. Developed by Landho Co., Ltd. and available exclusively for the Nintendo Wii system, the game will be in North America stores this August 2010. Gold’s Gym Dance Workout includes Latin dance styles, choreographed boxing dances and fun mini-games that target specific muscle groups. The game offers a wide variety of dance routines featuring popular Latin dance styles as well as a selection of boxing-inspired dance routines. The game supports two-person co-op mode, so players can grab a friend and dance calories away together. Players will have so much fun playing the game that they won’t even notice how much they’re sweating. In addition, the game offers multiple training modes to appeal to all fitness levels, and the difficulty of the gameplay evolves as the player’s fitness level increases. Players can also choose to work out around the world at five of Gold’s Gym’s most iconic locations, including gyms in Japan, Egypt, Australia, India and the legendary Venice Beach, CA. 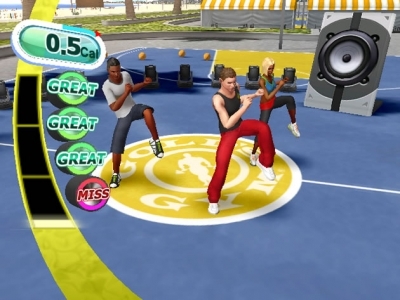 Compatible with the Wii Balance Board accessory, Gold’s Gym Dance Workout provides players with a personal experience. Players can build their own circuit program or have one created for them. Circuit programs include continuous dancing and mini-game sessions that provide a full cardio workout. In addition, the player’s exercise history, calories burned, and body mass index are stored in the game so players can track their fitness and weight loss progress as they strive towards their personal fitness goals. As part of the partnership, the game will be co-marketed by Gold’s Gym and Ubisoft. Each game will include a coupon for a one-week free trial to Gold’s Gym.